YORK, PA -- (MARKET WIRE) -- June 30, 2005 -- As the price of gasoline relentlessly rises, regional mass transit systems look better and better as an alternative to personal automobiles for daily commuting. But, as these systems expand to meet the growing demand they often run into an increasingly common dilemma. Much of the best technology available today is from Europe and Asia, but most regional systems are government entities that must observe "Buy American" mandates when upgrading their infrastructure and rolling stock. Fortunately, reconciling the two demands doesn't always require settling for a less than optimal solution. Chicago's Metra commuter rail system is a case in point. Metra serves nearly 300,000 riders per week with almost 500 miles of track and 230 stations in six counties. As part of a plan to upgrade both the efficiency of the system and customer satisfaction levels, Metra is replacing 165 aging double-deck passenger cars with new "Highliner" cars featuring the latest mass transit technology from around the world. Twenty-six of the new cars will be in operation by the end of 2006, with more to follow on a regular schedule. They are being built by a Japanese company, Nippon Sharyo, and powered by Toshiba engines, but the final drives, a key high-value component, will be supplied by Voith Turbo of York, Pa.
Voith's parent is a German company, but the final drives will be assembled and tested in York using wheels, bearings, seals, and gear couplings supplied by qualified U.S. suppliers. Only the housings and certain gears will come from Voith in Germany. "These units will help Metra meet the 60-percent American content requirement for the new cars with no sacrifice in either quality or technology," said Voith sales engineer Michael Klug. The drives feature an advanced design that helps prevent oil leakage, making the new cars more environmentally friendly than the ones they replace. They are also very compact and robust, which contributes to rider comfort by making the car's interiors more spacious, and to operational efficiency by reducing maintenance requirements. "Local content, a U.S. based service capability, and proven technical competence were the factors Nippon Sharyo looked for in a supplier," Klug added. "Our York operation met all of their requirements, and our ability to deliver Voith's worldwide experience from a local facility put the icing on the cake." The first 26 new "Highliner" cars went into service with Metra in January 2005, and the Voith plant in York will deliver a total of 116 final drives over the life of the program. "We expect this kind of partnership to be the model for many more regional transportation systems across the U.S.," Klug said. "The marriage of global technology and local manufacturing and service is very hard to beat." 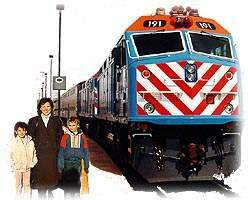 Commuting families benefit from the new Metra cars.